Abdul-aziz was in a much better mood prior to race 2 and I told him that he would, in all probability, have his best race ever (remembering a similar race of mine when I was forced to start at the back of the grid). I was nervous, as was series manager Sherif Al-Mahdy, Abdul-aziz took no prisoners and all we hoped for was an incident free race. Abdul-aziz made his customary great start (he also drag races regularly, so this helps). It looked like he took 4-5 cars before Turn 1. As we say them on the steep inclines of the inner circuit he really looked to be flying and by the end of lap 1 he had passed 7 cars and was chasing down his Championship rival. These two had battled many time and the wiley Al-Musalam had more often than not been able to keep Abdul-aziz at bay. Not this time, he sailed by, and by the next driver. Cars stream past, the track cutting through the desert stone. Fahad, who had started in 2nd had done a sterling job of keeping some of the quicker drivers at bay despite a fuel-pump problem which at one stage saw all 3 driver run into various parts of his car. This alowed Abdul-aziz to catch them and it then settled into a 3-way battle between himself, last years Champion Tarek Elgammal and the South American hot-shoe. After some very close, door handle racing Abdul-aziz was in 2nd place and looked to have the situation well under control. By this time, the leader Sheik Hamad bin Isa Al-Khalifa, had built up a sizeable lead. 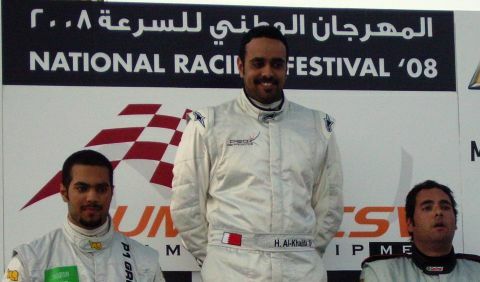 Abdul-aziz did his best and did bring the gap down considerably but Al-Khalifa drove strongly to take his first win. A delighted Abdul-aziz got out of the car and, as he said in the press conference, after this drive he felt like a Champion. 15th to 2nd was an extraordinary acheivement and I was flattered that he said he felt it wouldn't have been possible without the coaching I had given. Fahad also had a great race and after sacrificing some of his early pace to help Abdul-aziz battled hard and again finished an impressive 5th with much more competitive lap-times than he had been acheiving in earlier races. It also raised him to 6th place in the Championship.